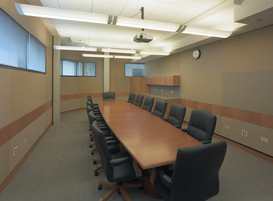 The Executive Conference Room is the perfect space for important board meetings or smaller, intimate groups. 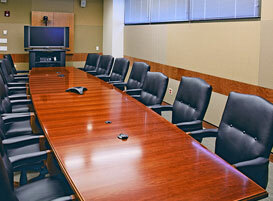 The room features 439 square feet of space set in a conference setting with oversize executive chairs. An LCD projector and screen, whiteboard and Wi-Fi are standard, and other technology, including videoconferencing, is available. Well-positioned windows provide natural light in this elegant setting.